Would just like to say how impressed I am with the dogmatic product. My dogs have had their dogmatics for over 6 months now and there is still no sign of wear and tear, no matter how dirty the dogs get the dogmatics whilst we are put. They have been through the washing machine many times and are still as good as when we first recieved the product. My dog's favourite past time was pulling me round the block before, they walked perfectly whilst out individually but take all 4 of them out and whoosh - we were off! Now we can quite happily walk for miles and walks have become so much more enjoyable. I have tried anti-pull harnesses, halti, gentle leaders, canny collars before and none have worked anywhere near as well as the Dogmatic. Yes - the dogmatic is more expensive but you get what you pay for. 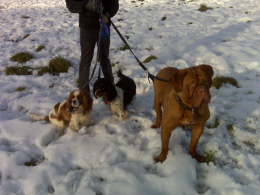 Thought you may like to see a photo of 3 of my dogs wearing their dogmatics - unfortunatley my 4th was very poorly at that time and so missed out on the photography session!